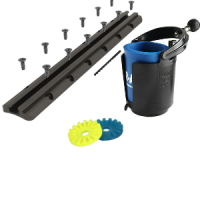 There are hundreds of different fishing accessories in this section, all of them are geared to make your kayak fishing experience a better one. They range from rod holders to fish finders. If you have any question please give us a call or send us a email. We have an expert fisherman ready to answer any questions you have. Happy Fishing! If you're one of the more than 46.2 million people that goes fresh or saltwater fishing every year, you can make your angling experience even better by doing it from a kayak. As great as fishing is, here at Paddlers Cove, we believe that nothing tops the experience of kayak fishing. Imagine gliding silently through the water, sneaking up on those fish while getting up close and personal with nature the whole time: It just doesn't get better than that! Like any sport, you can go kayak fishing with minimal gear -- we're talking your kayak, your fishing rod and a handful of bait -- but most anglers, whether casual hobbyists or hard-core fish-warriors, find that using the right kayak fishing accessories greatly enhances the experience. At Paddler's Cove, we offer a full range of kayak fishing gear; plus, our friendly staff -- all experienced paddlers -- love to share their knowledge. 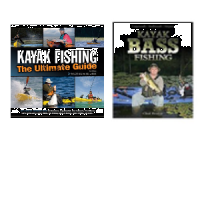 They're here to help you choose the best kayak fishing supplies for your needs. You may be asking how big of a difference the right kayak fishing accessories really makes -- and the answer may surprise you. Whether you're fishing for halibut or cod, snook or wahoo, trout or bass, the right equipment will make your fishing trip more comfortable, more convenient and more successful. Here's how. Kayak paddle holders provide you the perfect place to safely stow your paddle, leaving your hands free for important stuff, like netting that huge monster out of the water. Paddle holders fit into the wall of sit-on-top or sit-in kayaks, allowing you to get your paddle out of the way with minimal effort. Ditto with kayak fishing rod holders; simply pop in your pole when you have to attend to other matters and it's securely stowed. Kayak fishing seats are designed to keep you comfy while you're engaged in battle with bass, while waterproof kayak fishing apparel ensures that you remain warm and dry. Our range of fish finders utilizes the latest in angling technology; once you find a hot spot, our kayak anchors will keep you there. And then there's the kayak fishingaccessories, all designed to make your life easier -- from lights to packs to mounts and hardware. We even offer a catalog of instructional videos and manuals. When you're ready to get out there and catch the big one, the friendly Paddlers Cove staff is here to help you find the best kayak fishing gear for your budget and needs.